Can you imagine my excitement on the day I was flying to Maui? Coconut trees, wearing hibiscus on the head, and even hula girls suddenly all seem so much less tacky! Virgin Lava Flow, here I come! To be fully fashion-ready to embrace the tropical breeze as I get off the plane, I chose a tie-dye one-shoulder jersey dress from Forever 21 (a total steal considered this DVF number costs $495!). 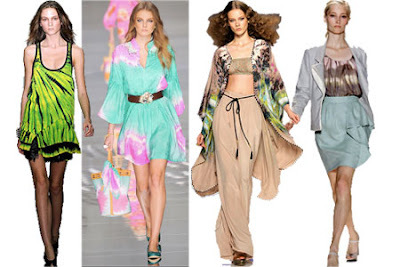 Believe me, I never thought I would be a tie-dye girl, but the interpretation from Spring 2010 runway has never looked so chic. Take a cue from Proenza Schouler, Bluemarine, Etro, and Lela Rose. To add more depth to the dress, I usually like to wear a belt to break up the top and the bottom. Unfortunately, I forgot to pack the appropriate belt…. Thinking quick on my feet, I picked up my husband’s, and I think it worked out for the better! With the one-shoulder cut, the tie-dye print, and the belt, there are already enough details to the overall outfit, so I knew I wanted to keep my jewelry simple. I opted for colorful stackable bracelets and left my neckline open to give a more casual and free-spirited feel. Finally, to stride into the resort with style (literally), I chose a pair of nautical rope sandals for three important reasons: (1) they are comfortable and I can walk in them for hours, (2) the brown goes with any one of the outfits I packed for this trip, and (3) heck, the rope detail just screams ocean! Remember ladies: the key to traveling light is to never pack more than three pairs of shoes! Think I had it easy on my first day? See how I tackle a day of outdoor adventures that involves bamboo forest, cave exploring, and waterfall diving on my next post!